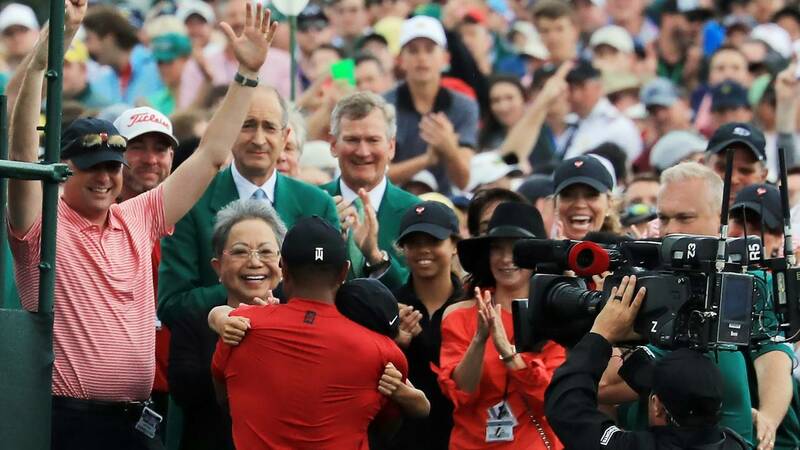 Tiger Woods celebrates with his son Charlie Axel, his mother Kultida and daughter Sam Alexis as he leaves the 18th green after winning during the final round of the Masters at Augusta National Golf Club on April 14, 2019, in Augusta, Georgia. That is how Tiger Woods attempted to describe an extraordinary Sunday. A fifth green jacket, his first major win in 11 years; a story that the world had resigned itself to never seeing again. It has already been coined by many as the greatest sporting comeback of them all -- a journey that has included career-saving spinal fusion surgery and a tumultuous series of personal problems that threatened to bring an end to the career of a golfing icon. As he completed a composed two-putt on the 18th for -- almost certainly -- the greatest bogey of his distinguished career, he thrust his arms aloft, his club above his head. He gave a trademark fist-pump, before taking the acclaim of his playing partners, all accompanied by a fervent roar from an adoring public. Then, he found his family. It was an image for the ages -- the completion of a cycle that many feared would never reach its natural end. Woods famously embraced his late father Earl after winning his first Masters in 1997. Now, Woods -- the father -- was embracing his children, his mother, his girlfriend and anyone else in his vicinity. "I did the same thing to my dad and now I'm the dad with my son doing the same thing," he reflected to CNN's Andy Scholes. "It's amazing how life evolves, changes. "That was 22 years ago, when my dad was there and then now my son's there, my daughter was there, my mom's there. My mom was there 22 years ago and the fact that she's still around, still kicking, still fighting, goes to show you her resiliency. "It's hard to comprehend right now. I mean, honestly it's only been a few hours out of winning the tournament. I'm still trying to enjoy it and figure out that I actually won it. "I know I have the green jacket on but it's just, it's still, I think it's going to take a little bit of time to sink in." Midway through Woods' fourth round, it was a dream that looked like coming up short. Francesco Molinari -- the American's scourge at the 2018 Open Championship -- looked like holding him off yet again. But as the Italian found water on the perilous 12th hole and Woods located the heart of the green, it represented a changing of the tide rarely seen. A path opened up and the atmosphere on the famous old course changed as Augusta's patrons began not just to hope, but to believe. Woods, of course, had never lost faith. Champions always believe, and there have been few serial winners more ruthless than this golfer, whose significance has long-since transcended the game of golf. "I did think it would come," the 43-year-old told CNN of his everlasting dreams of a 15th major. His battle with Molinari at Carnoustie had given him that belief. He had also finished second behind Brooks Koepka at Bellerive in the 2018 PGA Championship. "I knew it was in me, now did I know it was going to be this week? No. But I had a good feeling that the way I was shaping the golf ball that I was going to be in the mix," Woods, who will now climb to No.6, added. "Now being in the mix and winning a championship are two totally different things. The last two major championships, yeah I was in the mix, but I didn't win. "It all flipped at 12 you know when Franky made a mistake there. He just let everyone back in the tournament. And with six or seven guys with a chance to win the championship it got a little complicated but fortunately I was able to hit some of my best golf shots all week." Sunday's thrilling victory puts the former world No.1 just three majors behind the all-time record of Jack Nicklaus. Only fellow American Nicklaus has won more Masters, with six. Woods also joins Nicklaus as the only player to have won the Masters in three different decades after he clinched his first as a 21-year-old in 1997. "It's overwhelming just because of what has transpired," Woods added in the Green Jacket ceremony in the Butler Cabin. "Last year I was very lucky to be playing again. At the previous Champions Dinner I was really struggling and missed a couple of years of not playing this great tournament and now I'm the champion." "It's been an epic Sunday here at the Masters and a great day for golf, just one of the most amazing days in our history," said Augusta National chairman Fred Ridley. Many wrote off Woods' career as the injuries took their toll on his form, world ranking -- he plunged to outside the top 1,000 in 2017 -- and quality of life. He admits he struggled with everyday tasks such as getting out of bed, driving and taking his kids to school, and is widely reported to have confided at the pre-Masters Champions Dinner a couple of years ago: "I'm done." But after seeing a specialist in England, Woods underwent fusion surgery, his fourth back procedure, in the US. However, if things looked bleak from a playing point of view, Woods looked to have hit rock bottom when he was arrested on a driving under the influence charge in May 2017. He pleaded guilty to reckless driving and was put on a diversion program, but from that nadir, Woods' trajectory has reached sky high. On doctor's advice he made a tentative return to hitting golf balls at home in late August 2017, and returned to the circuit in 2018 with remarkable success,. He briefly led the Open at Carnoustie before finishing second to Koepka in the US PGA and winning the Tour Championship for his 80th PGA Tour title, just two behind the record of Sam Snead. "This will be up there with one of the hardest I've had to win because of what transpired over the last couple of years," he added. "it was just an amazing buzz out there, trying to figure out what was going on but to stay present and focused on what i was trying to do. I kind of liked it."